Silk for praise, prayer, worship and wear. 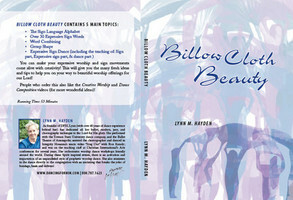 Have you ever seen those beautiful billow cloths and wondered how to use them? Do you want some creative ideas for their use? Would you like to learn the mechanics of using them in a step by step fashion? Then this DVD is for you! The video clip here, only briefly shows just a fraction of all the teaching and information contained in this dynamic educational video! There is also a lovely worship time at the end incorporating billow banners. She also incorporates dancers and some flags. You’ll get many wonderful and helpful ideas in the professionally produced and edited 52 minute DVD. Would you like some beautiful ideas using veils? Would you like to add veils to your choreography? Would you love to learn a dynamic contemporary dance piece? 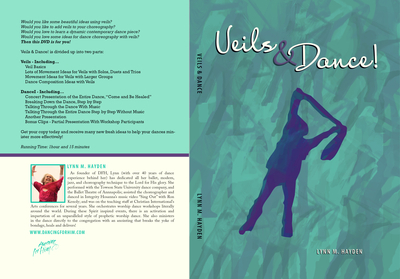 Would you love some ideas for dance choreography with veils? This is the DVD for which everyone has been asking. If you’ve always wanted choreography ideas, dance patterns to put with any music or dances to follow and learn, this is the DVD you need! 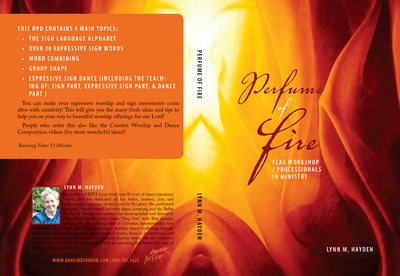 Within the three main categories, PRAISE, WORSHIP & FLAGS, there are dance steps and patterns taught by Lynn Hayden with easy to follow ‘from the back’ teaching. She takes you through every movement in a well explained manner, so you will feel comfortable learning. PRAISE – This section has a combination of patterns with 28 counts of 8 that can be used to any of your favorite 4/4 time, upbeat praise music. Lynn recommends putting it to Shekinah Glory’s, “Higher” from their Live CD. However, any of your favorite praise songs would compliment it beautifully. It is demonstrated to a song on the Having Done All CD that can be found in this book store (under Music). Or you can see it immediately below in the Related items section. WORSHIP – This is a lovely, easy to learn worship dance to a beautiful song called, “Morning.” This dance has some ballet movements with a gentle flow and sweet spirit to capture the heart of and minister to the congregation. The music to this dance, from The Parable of the Dancer, Pursuit of Grace CD, may be found in the Dancing For Him bookstore and can easily be located below, in the Related Items section. FLAGS – There are actually two different flag dances. One is to Rick Pino’s song, “Spread Your Wings” which is an anointed ministry piece that will touch the hearts of the viewer. This may be purchased here in the bookstore and found below, in the Related Items section. It is from the Renaissance CD. The other one is faster and has a series of patterns that can really be put to any upbeat praise song. While Lynn recommends Shekinah Glory’s song, “Awesome God” from their Live CD, it is shown on the DVD being done to a song from the, Having Done All CD. This may be found below, in the Related Items section. 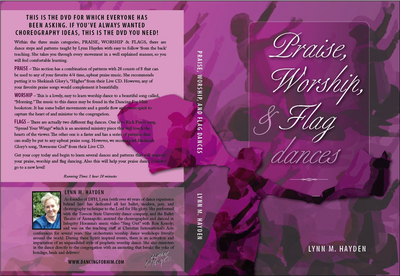 Get your copy today and begin to learn several dances and patterns that will improve your praise, worship and flag dancing. Also this will help your praise dance ministry go to a new level! You’ll absolutely love this DVD!! It is full of 1 Hour and 58 minutes of flag ideas as well as an entire processional/ministry dance. The Flag portion has lots of creative ideas that you can do with flags including an entire expressive vocabulary! The dance is repeated several times from different angles, so you’re sure to get the whole thing. It can be done to any slow 4/4 time music and is perfect for Easter/Christmas productions. XLarge & XL Round In Stock Discount Days!! !